Kids Vans is the original streetwear brand at the heart of youth and skate shoe culture. 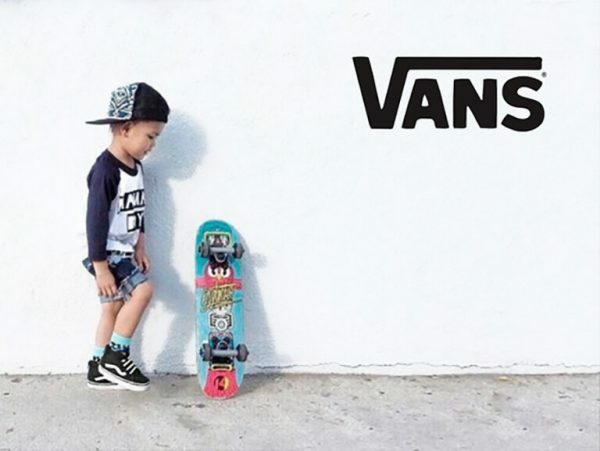 Grounded by authenticity and individual style, Vans kids shoes are well used for skate, surf and play by the coolest little ones from across the globe. Every kid must own a pair of classic Vans shoes. Kids Vans shoes originated in the US and made a huge claim to fame in the early 90s. Inspired by famous skaters such and Tony Hawk and bands like Faith No More, Vans shoes became an iconic and sort after brand. Camino Kids carries numerous Kids Vans Shoes. The Vans Old Skool Kids shoes, which are also available for toddlers, is the most popular style of the Vans range and has become a wardrobe staple for kids. These shoes feature the iconic Vans tick, vulcanise rubber sole and velcro straps for kids under 5. If you’re looking to buy a gift, Camino Kids often feature Kids Vans Sale Australia-wide, be sure to signup to our newsletter never to miss these opportunities. Every kid needs Vans shoes in their wardrobe! It’s either Converse or Vans. You will be hard pressed to find a wardrobe around the world that does not have a pair. Your kids shouldn’t be any different. Grab a pair of Kids Vans Online now. Oh, did we mention we also have a range of Vans Baby Shoes for the perfect introduction into this beautiful planet? All Vans shoes have been quality checked and approved for the use of children aged 0-8yrs.